Hi Guys...in my last post I talked about Carnival because that was the season at the time. With this post I want to tell you a little more about my beautiful twin Island...TRINIDAD & TOBAGO….yes I’m giving you some more snippets so you can get a better idea about life over here. So to start I'll do it like the typical countdown. 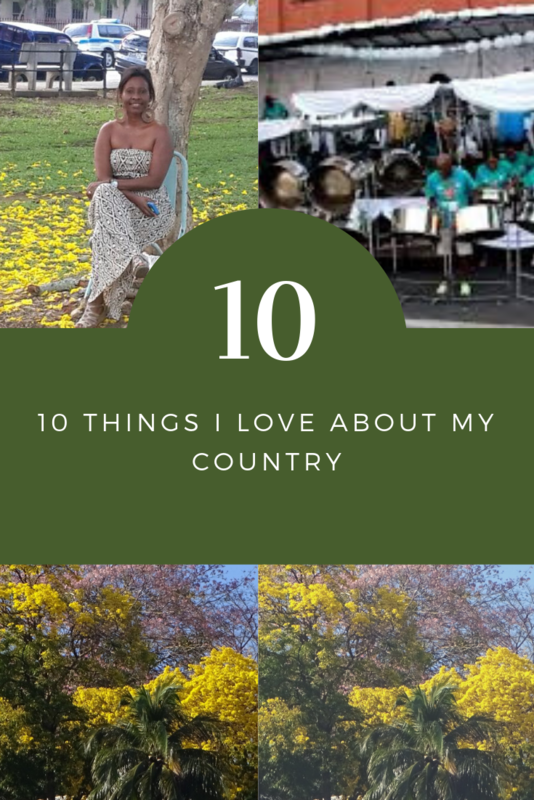 Now I’m going to mention 10 things I love about my country but there are hundreds more but I don’t want this post to become an ebook. In Trinidad we are so friendly that you might encounter or as we say “bounce up” a person 3 or 4 times for the day at different places and you would still be greeted as if we just saw you.. With a smile maybe event stopping for a short chat. We enjoying chatting and even though I saw you an hour ago I will still smile a greeting at you when I see you 3 hours later at the grocery. We have sun most of the year. We have basically two seasons, dry and rainy. In fact right now its extremely bright outside and sunny. The sky is a beautiful cerulean blue, the mountains are green and our weather is just so invigorating. That’s why most Trinis go to the beach on the weekends because it’s bright and sunny and hot as heck. But our heat is a nice heat followed by lots of breeze and birds chirping and fabulous blue skies. Our worst weather is during the rainy season, which starts June and runs to December. Our dry season is from January to May, so we’re in the dry season right now but we will still have some rainy days occasionally, mainly if a tropical depression is in the vicinity. But that’s great though, its great for the plants and it helps cool down the heat. Our culture is a melting pot of people from different ethnic and cultural backgrounds….from Portuguese, Spanish, East Indian, Syrian, Chinese, African. The population is mainly comprised of blacks (the descendants of former slaves), East Indians (originally brought to the island as contract laborers from northern India), whites, and Chinese, many of whom are racially and culturally intermixed. The ethnic makeup of Trinidad is dominated by two groups, roughly equal in size: blacks, descended from slaves brought in to work on cotton and sugar plantations beginning in the late 18th century, and Indo-Trinidadians, or East Indians, whose ancestors were primarily labourers who immigrated from the Indian. I am afro Trinidadian with east Indian, Mulatto and Carib. Caribs and Arawaks were the indigenous Indians that were found oon the Island by the English settlers. You will find people with East Indian surnames but they look black or a person mixed with chinese and east indian ethnicity with an african black surname. We also have caucasians, who are mixed with portuguese and something else (could be any one of the other races). I love the mixtures. Our food is a combination of the cultures. So you can get Indian food, Arabian food, Creole food, Spanish dishes and more. The key or basic meals we eat I found out recently is very similar to what they eat in most Caribbean Islands as well as in Brazil. That meal is lentils and rice with stewed chicken and salad on the side. A side-walk or street food we all love day or night is doubles. This is eaten at the side of the road where the vendor sets up his box and serves you the doubles on sheets of paper. Our typical breakfast would be doubles, if that’s what you’re feeling for or scrambled eggs and fry bake. Lunch is white rice, peas, and stewed chicken or pelau or callaloo, rice and stewed chicken. Dinner would be what we had for lunch or Crix biscuits and cheese with a cup of tea. You can google the recipes easily. I have to be honest when I was young I didn’t really appreciate or Pan music or our calypso music, but as you get older you start to understand and get into the beat. Plus the first time to attend a Panorama competition and list to 16 Steelband groups play different or popular calypso songs you feel so different. The effect is amazing or when as the different pan sides are waiting to go unto the stage to perform their pieces and they are practicing on the sides, to walk through them as they practice is again an amazingly enjoyable experience. The sweet music and harmony that can come from a tuned steel drum is just awesome. That is why people come from all over the world just to experience playing pan in our Panorama competition. Trinidad is made up of hills and lots of vegetation. We have the largest round-about that has an array of trees for example the Poui which flowers coming close to rainy season. It’s a beautiful yellow or different shades of pink and they pop up all over the mountain side. It looks so pretty and when the flowers fall the ground looks like it’s sprinkled with yellow or pink dust. Just beautiful…. I enjoy visiting our botanical gardens which houses a variety of trees native to Trinidad. We have about 386 trees that are native to Trinidad, such as, the bougainvillea, Chaconia or National flower, Crown of thorns, Hibiscus and many more. We have lovely nature tours and places where you can spend a few days and watch the hummingbirds of which we have the most number of species. Places like Asa Wright Nature Centre, Yerette for the hummingbirds and visit an old Cocoa house in Lopinot. Trinidad is the business hub of the Caribbean with our skyscrapers and many banks and businesses. It’s like the Las Vegas of the Caribbean and Tobago our twin Island is like the sanctuary and place of relaxation and get away. Trinidadians go Tobago to get away and relax when they need some R and R. Tobago is very slow paced, more relaxed and has the better beaches. The food is amazing and the people are even friendlier than Trinidadians. Yes…every country has some type of issue, because of our location we do have outsiders trying to use here as the go between for drugs and guns but the gangs or individuals that are involved in that tend to be harming each other and many countries are having that problem of controlling the greedy, drug cartels, gun runners, human traffickers but here at least we aren’t in a war with anyone, our economy is doing fine, our Government is working hard to make sure things run smoothly despite the fact that politics can be a hindrance rather than a help, but we manage. And as one Calysonian said in a song, our treasury could bun down but we will still be partying. I remember once there was a hurricane warning and we were asked to stay indoors, but no, not Trinis, some people were having hurricane parties…yep no matter what is happening we tend to keep a light spirit and still look for the good side of life…as we tend to say here…life is way too short to fuss too much or to fuss on the small things. On an aside another thing I love about my country is the fact that we are very religious in that most of us believe in some type of higher being. Most believe in God and we put our faith in him to help us through whatever trial we may be facing. My life is guided by him and all that I have he has blessed me with and I thank him everyday for his goodness. Thank you Jesus. So that’s it people…I hope you enjoyed getting a sneak peak into some of what the lifestyle in Trinidad is like. Hop you enjoyed it and as one of my followers mentioned…she would love to visit Trinidad for Carnival and I said…heck yes…its something to experience at least once, especially jouvert. Bye for now and check you for my next post.